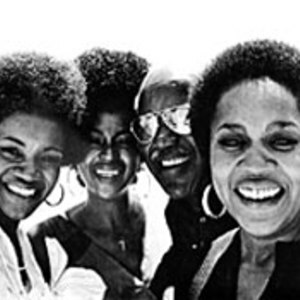 The Staple Singers were a United States gospel, soul, and R&B singing group featuring three daughters & their father, Pops Staples, the patriarch of the family, who formed the Chicago based group in 1951. They signed with United Records, then Vee-Jay, Riverside, Epic and, eventually, the black-owned indie Stax Records label where they hit their most fertile commercial peak in the early 1970's. In 1967, on Columbia subsidiary Epic the Staple Singers first began moving into mainstream pop markets with "Why (Am I Treated So Bad)" and "For What It's Worth" (written by Stephen Stills[/track]). In 1967, on Columbia subsidiary Epic the Staple Singers first began moving into mainstream pop markets with "Why (Am I Treated So Bad)" and "For What It's Worth" (written by Stephen Stills[/track]). In 1968, the Staple Singers signed to Stax and released two albums recorded with Steve Cropper of Booker T & The MG's fame - Soul Folk in Action and We'll Get Over. By 1970, Al Bell had become producer, and the family began recording at the famed Muscle Shoals studio, moving in a more funk and soul direction. The first Stax hit was "Heavy Makes You Happy (Sha-Na-Boom Boom)". In 1972, the group had a No. 1 hit in the United States with "I'll Take You There." Their 1972 recording on Stax of "Respect Yourself," written by Luther Ingram and Mack Rice, was number 2 on the R&B charts and a top 40 pop hit as well. The song's theme of self-empowerment had universal appeal, released in the period immediately following the intense American civil rights movement of the 1960s. During this Stax period they appeared at a 1972 summer concert at the LA Memorial Coliseum attended by 100,000 people and documented in the 1973 film and soundtrack album [album artist=Various Artists]Wattstax. The Staple Singers then signed to Curtom, Curtis Mayfield's imprint, and released the soundtrack to a comedy film co-starring Bill Cosby called "Let's Do It Again". The soundtrack was produced by Mayfield; and the title song was a huge hit in 1975. After this, however, they were not able to regain their commercial momentum, releasing occasional minor hits, and moving from label to label including Warner Brothers and 20th Century before returning to Epic in the mid 80's. Lead singer Mavis Staples began a fruitful solo career in earnest that continues to this day and involves live performing with her sister Yvonne Staples. The other daughters in the group who did not pursue solo careers were Pervis Staples, and Cleotha Staples. In 1994, the family reunited to record a duet with Mary Stuart (reprising their Last Watz style backing on a cover of "The Weight" by The Band), somewhat re-establishing an audience. Pops Staples died of complications from a concussion suffered in December 2000.